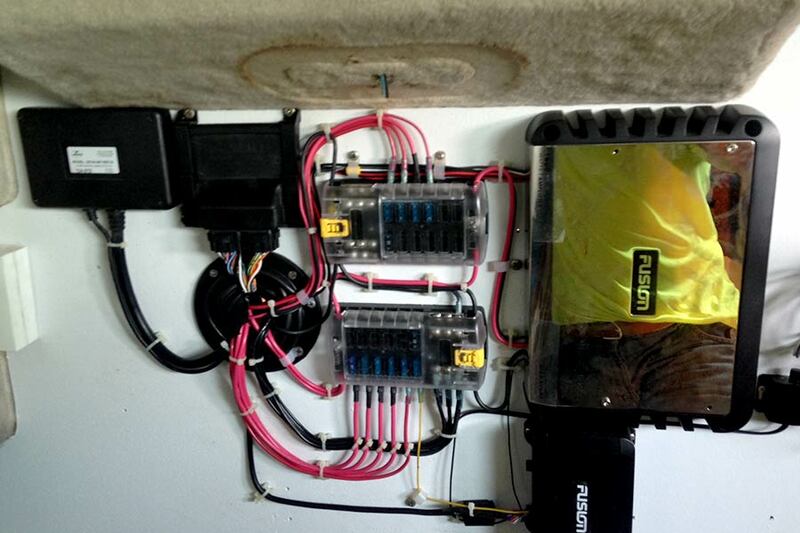 ABOVE: an example of a recent electronics repair and installation job performed here at Homosassa Springs Marina. Driving your boat is fun, but sometimes you want to anchor in shallow water to fish a specific spot, swim with manatees or scallop or eat a picnic lunch. In the old days, you’d have to walk to the bow of the boat, pull out the anchor, heave it overboard and tie it to a cleat. When you were done, you’d pull the anchor up, try to clean the mud off it while not getting too wet in the process, stow it in the anchor locker and get back to the helm before the wind blew you where you didn’t want to be. Power Pole shallow water anchors give us a better option! 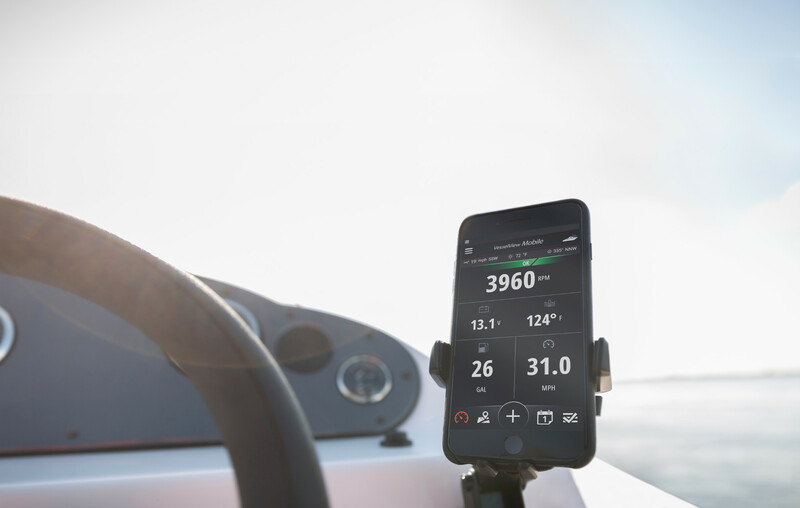 We can anchor in water up to 8 feet deep with the push of a button. There’s no noise or splashing to scare away the snook, no mess to clean up on the bow, you don’t have to jam the boat into reverse to set the anchor and you can raise or lower it in less than 4 seconds keeping you in your sweet spot regardless of wind or current. 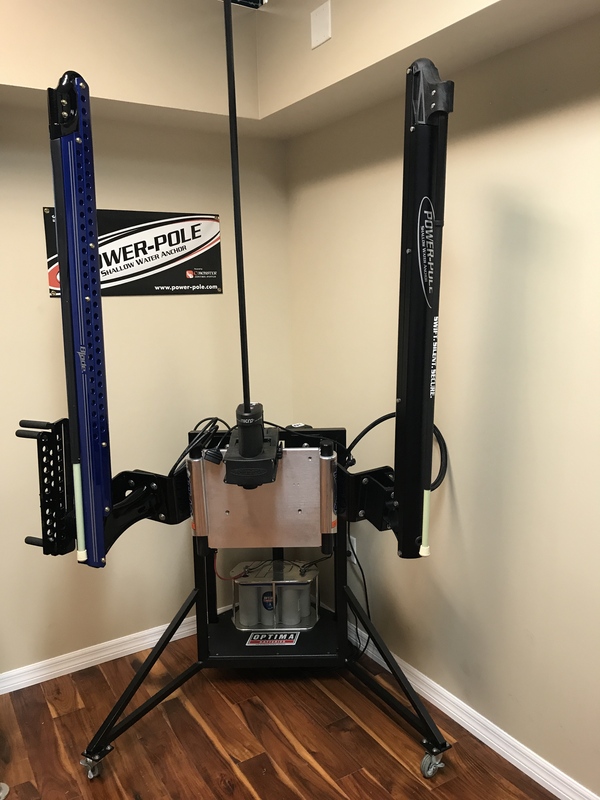 Power Pole makes 4 different anchoring systems to accomodate your boat with the Blade series, Pro II series, Sportsman series and Micro series anchor for small skiffs and kayaks. 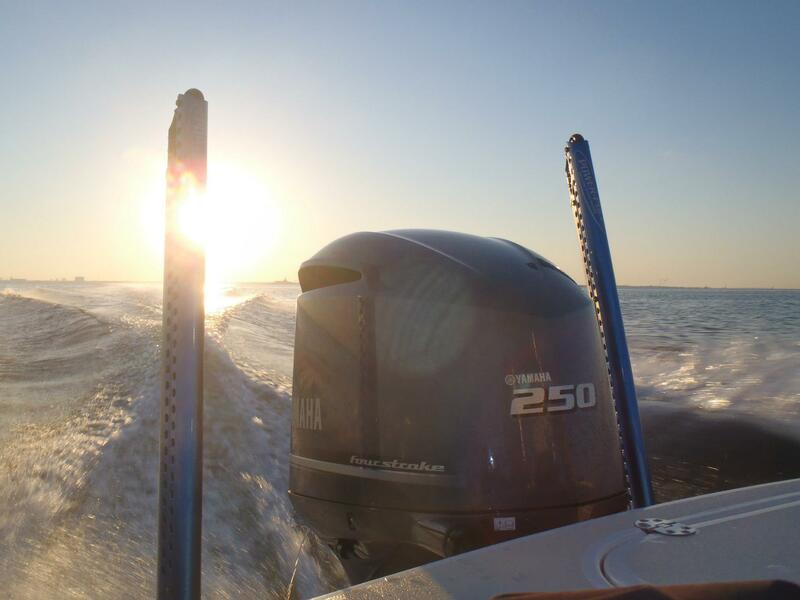 We are a Power Pole installation center and have done single and dual installs on pontoon boats, fishing boats and Hurricane deck boats. Power Pole makes about 50 brackets to give us the best mounting option though we’ve had to custom fabricate brackets for some of the newer pontoon boats. We can mount the Power Pole to your jack plate bracket or engine bolts to avoid drilling any new holes into your transom. As a Power Pole Warranty Center we can repair or replace any worn or damaged components. It’s a fact of life, boats and everything on them breaks. They spend their life getting beaten up in salt water, seldom rinsed off properly and go long periods of time not being used while the salt that wasn’t washed off from the last 5 trips starts eating away anything metal and corroding all of your electrical connections. If we treated our bodies the way we treat our boats we’d all be in wheelchairs at age 30. You might have a stereo that stopped working; an engine that doesn’t start or one that idles fine but has lost its power; bilge pumps and live well pumps are notorious for going bad (you would too if your switch was left on and you pumped dry air for 2 hours instead of water); your steering is stiff or worse, you can’t steer; new batteries installed yesterday seem to go bad overnight - it’s probably not the battery but a parasitic load somewhere in your electrical system caused by corroded wires. Your little nephew thought he’d help with the anchor but dropped it square on the deck and took out a chunk of fiberglass. These are common problems we see with boat ownership. Many of us let the little problems build until a big one keeps us from using the boat. 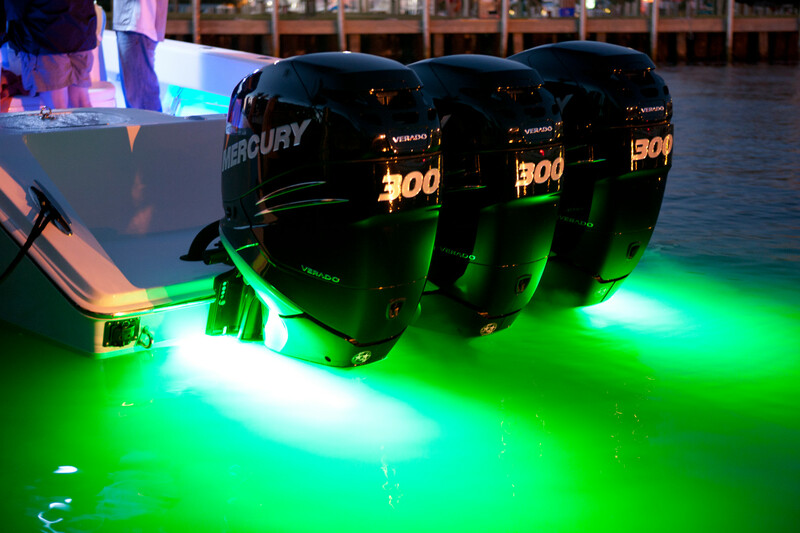 Some problems are easy to fix without much training, others require an extensive understanding of outboard engines, electrical systems and steering systems. In order to fix the issue, you first need to troubleshoot and properly diagnose what is causing it and then repair or replace the components that are causing the problem. Most parts are bolted on, and the last time that bolt was tightened was 5 years and 100 salt baths ago so now it’s corroded in place and needs to be torched or ground off. Maybe you tried that yourself and sheered the bolt and now you really can’t get it out without drilling and tapping it. You’ve been working on the 15 minute job for 4 hours now and would really rather be watching TV. At some point, you’re gong to decide you can’t or don’t want to repair your boat and it’s time to take it to a professional. We have boats and engines coming in to us in pieces after a DIY went wrong and some that come to us as soon as a problem happened. Our mechanics chose this profession because fixing boats is fun for us! Some people relax doing crossword puzzles, some play football or fish; we fix boats because solving problems is what drives us. Working our way through an electrical schematic to figure out what the white and green wire does, finding a small tear in a fuel pump diaphragm, figuring out why cylinder #3 won’t hold compression….. these are bragging moments for us and this is what we talk about at home over dinner. You want someone who lives and breathes this stuff to be the one fixing your boat when something breaks. So what can we do, what have we fixed? We saved a boat that had sunk and was totaled by the insurance company - the owner paid off the salvage fee and through replacing electronics and pumps and rebuilding the engine was able to keep his favorite boat and saved the cost of buying a new one. a twin engine offshore boat was struck by lightning with all of its electronics fried. a customer noticed his power was off and he wasn’t cruising at the same speed he used to and his fuel economy went down the drain. We identified a 1.8mm section of his reed valve that had sheared off and scored a cylinder wall keeping it from making power. We rebuilt the motor, restoring his power and fuel economy and did it for half of what a new engine would have cost. a customer had his stereo replaced - TWICE. The stereo didn’t work and his lights kept burring out. We found a short in the wire harness between the boats hull and deck liner and repaired the harness. a customer drove his boat to us on the water at idle speed because he couldn’t get above idle. Identifying the burnt out Idle Air Controller was the easy part, but IACs don’t typically melt like this one. We did further testing and determined his Engine Control Module was faulty and sending a continuous signal putting the IAC into 100% duty cycle. 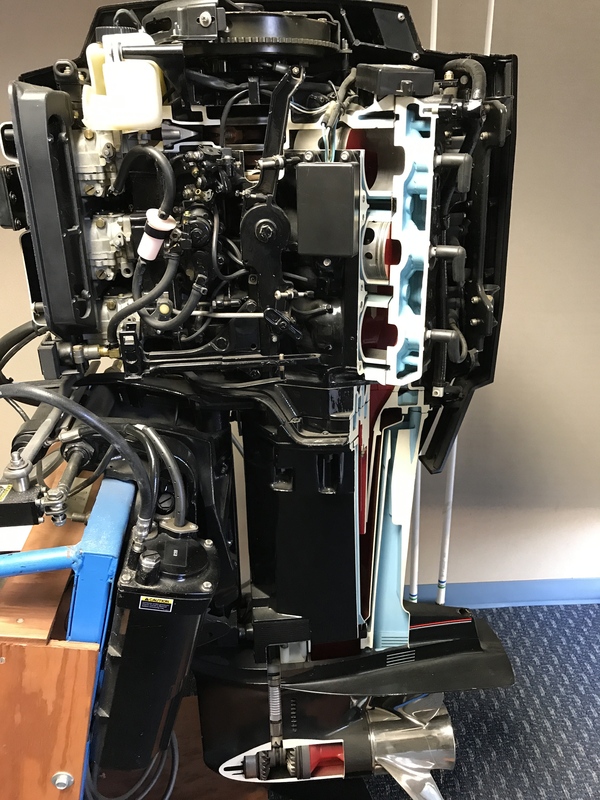 We sent this diagnostic data to the engine manufacturer and even though the engine had been out of warranty for 6 years we were able to convince the manufacturer to cover the entire job under warranty and replaced the ECM and IAC at no cost to the customer. Not all jobs are big and some not so exciting but they all need to be done and we like doing them. Our job is to find your problem and fix it right the first time so you can get back out on the water. While working on one problem, we check the boat out to see if there are obvious signs of other problems. Our diagnostics might point out something that the boat owner wasn’t aware of. We provide a full report of what we have found and done along with our recommendations. We understand the constraints of time and money and will give you an honest assessment of what issues need to be solved now and which ones can wait. We are all boat owners and experience the same issues you do, we’ll treat you with the honesty and professionalism we like to be treated with. 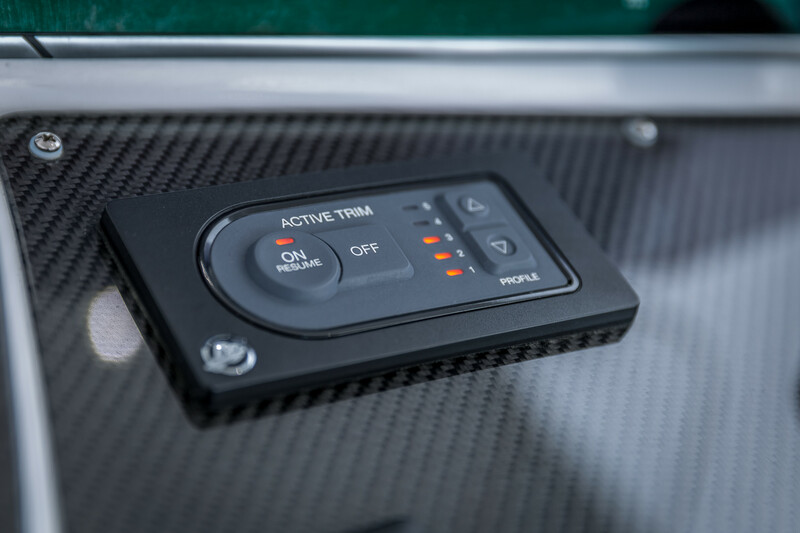 Would you like to install a GPS, stereo, underwater lights, or a washdown pump? We perform installation as well as general troubleshooting and repairing of most issues on a time and materials basis. We have technicians on staff 7-days per week. We're on the water and know many folks spend months planning their perfect vacation in Homosassa, spend a bunch of money to get here and then face the challenge of something broken on the boat during the vacation. 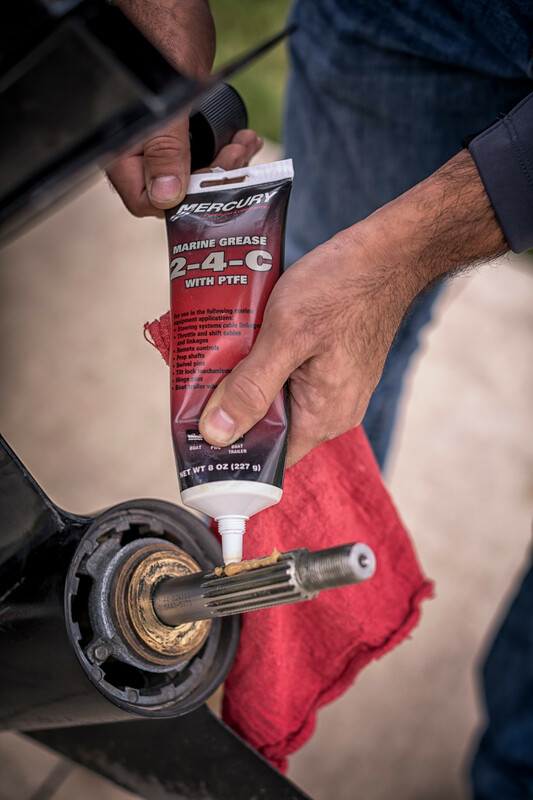 We're here to help rescue you from spun hubs, chewed up props, clogged filters and the other little items that can keep you off the water during the limited time you have here. On weekends we offer emergency repair service which prioritizes vacationers who have broken down. We'll give you head-of-the-line privileges on minor repairs and get you back in your boat as soon as possible. If you need extensive repairs, we'll try our best to free up one of our rental boats for you to use to make sure the kids and your guests have the boating fun they expected.